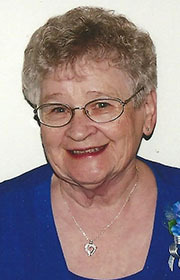 STRATFORD — Alice Thompson Spitler, age 94, of Stratford passed away on April 13, 2019, with her loving family by her side. A service to celebrate Alice’s life will be held at 10:30am on Wednesday, April 17, 2019, at the McGuire Bend Church near Dayton. Visitation will be held Tuesday, April 16 from 5-7pm at the Calvary United Methodist Church in Stratford. Foster Funeral Home in Webster City is assisting with arrangements.